The IEP is the “blueprint” the school must use for your child’s program. It all begins with accurate and up-to-date Present Levels. A good program and placement begins with an appropriate IEP. 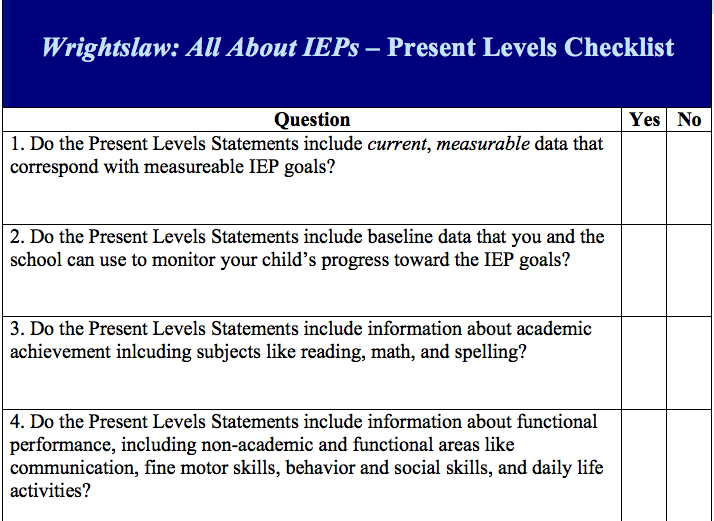 If you’ve been keeping up with your Summer School assignments, you know that an appropriate IEP begins with……………? Your homework assignment this week: Create a blueprint for your child’s Present Levels. Need more information before submitting your form below? Use the Present Levels Checklist to help you out. Or, get 10 Tips about Placement. Homework Assignment. Directions: Make three lists. (1) Make a list (list #1) of your child's strengths. (2) Make a list (list #2) of your child's challenges. (3) Make list 3 (list #3) that builds on your child's strengths and corrects his areas of challenge. The special education (specialized instruction) and related services your child needs. Any adaptations, modifications, and accommodations your child needs in addition to special instruction. (4) Click submit to submit your three lists. This entry was posted in IDEA 2004, IEPs and tagged Present Levels, Present levels of academic achievement and functional performance, Wrightslaw Summer School Series by Wrightslaw. Bookmark the permalink.